The furniture collection includes, among other things, handy stools, once used on farms for different purposes, consisting of the seat and monolithic, four-legged base. Naturally produced whorl, formed during the growth of the trunk and branches of trees, was used by designer as the base for the stool. It is the structural backbone of the object - thus the stool is composed of only two elements. The piece of furniture designed by Arthur Gosk refers to the original`proportions and shape. The number of elements of the object was reduced to a minimum. 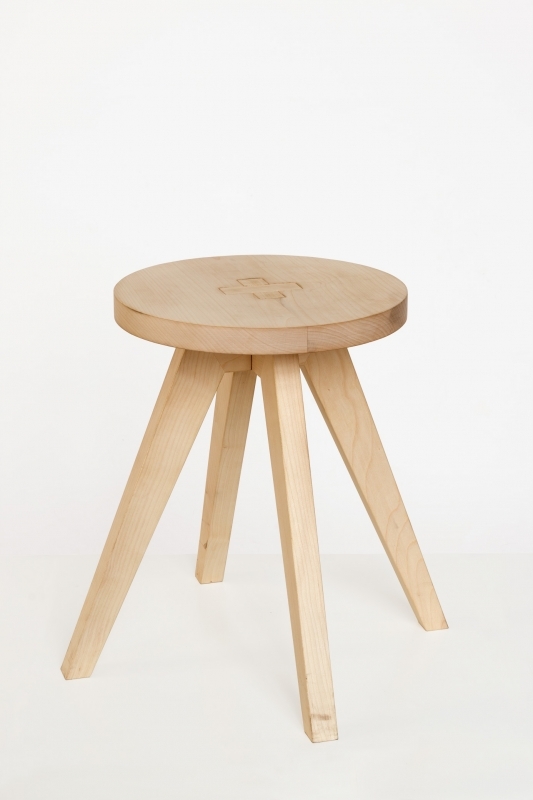 Due to a significant precision of making the stool, you can produce this object by using not only traditional carpentry techniques but also modern CNC machines. The stool is made of three parts and in its individual nature is influenced by different materials (solid wood, plywood or wood-based boards) and the shape of the seat referring to basic geometric figures. User can select different heights of the stool. Resulting from an observation of nature, the most primitive for human - was the use of abundant occurring self-produced forms in nature. They were giving a various opportunity of their practical usage. Resulting from an observation of nature, the most primitive for human - was the use of abundant occurring self-produced forms in nature. They were giving a various opportunity of their practical usage. They went through the simplest processing by using only ax and knife, minimizing both the processing and the form. The stools if not entirely monolithic, composed of two or three interconnectable components. It was important to make structural simplicity during the creation of stools, which is not a natural charm depriving forms of wood but made that it was possible to create a piece of furniture in the short time, that we perceive today as the original. This type of authentic stools is known in various European countries. These stools were used in domestic, farm and craft work, eg. peeling potatoes, sitting at benches during meals.